Tyler “Aether” Glaiel and Jon Schubbe‘s new game Closure is worth some attention. It’s a platforming game with a rather cool gameplay mechanic: the player explores a dark world, where surfaces only exist when they’re illuminated. The art’s roughly-textured but pretty, and the lighting mechanic looks good and works quite well. The story’s quite competent, if a bit cliché. (that car accident you see at the beginning of the game? Guess who was driving.) There’s just one problem: the character control is awful. Let me elaborate. This is a good game. However, the platforming part of the gameplay is clumsy to the point of frustration. On several levels, I had figured out the solution, but implementing it had me dying repeatedly because I just couldn’t get the player character to do what I wanted her to do. The main issue is with the jumping. The PC has a very low and short jump for a platforming character, and the hit detection on landing is very finicky. There are many gaps which the PC can just barely jump across, but only if the jump is timed just so. It doesn’t help that the jumping feels a bit… gummy, as if there’s a delay between the button press and the action. This problem is compounded by dodgy collision detection at the edge of lit areas. The player is often asked to jump off of the top of a partially-lit wall, and the game never seems quite sure if it should allow you to jump off of a certain surface, or make you fall through. Often, it will do both, making the PC fall through a surface and then leap back up onto it with a net movement of zero. I see this problem a lot in more artsy and experimental platforming games. Maybe it’s because platforming is seen as such a common mechanic that it doesn’t need much time spent on it. However, causing frustration to the player, especially in an already-tricky puzzle-solving game, is rarely a good thing. The developers must have been aware of how clumsy the game was to control, and I’d prefer if they had fixed it. To their credit, it’s impressive that the game is as controllable as it is, given the complexity of the lighting mechanic. But a few tweaks — lengthening the character’s jump, allowing a margin of error on liftoff, and doing some averaging on the collision detection at light boundaries — would make the game play a lot smoother. Richard “KirbyKid” Terrell would be my go-to person on the intricacies of platforming mechanics. He’s analyzed Super Mario Bros. more deeply than I would ever care to, and he’s got an eye for detail, especially with running-and-jumping games. For more on effective low-level gameplay, visit his blog, Critical-Gaming Network. Thanks for the glowing reference. I played a little Closure just now, and I think I understand where you’re coming from. Closure is a lot like Braid. It’s a puzzle game that uses 2D side scrolling platforming mechanics as a base/foundation. Where Braid is all about manipulating time and space, Closure is about manipulating space/matter/and light. 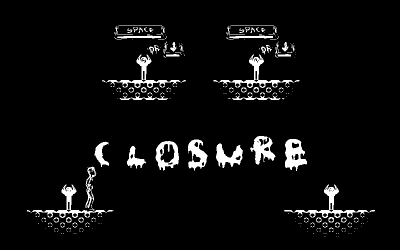 I ran into some of the frustrating experiences you described when I was playing Closure like a platforming game. I was cutting the timing really closely and trying to make crazy jumps. But, like Jonathan Blow would say, there’s an elegant solution to it. For closure, the elegant solutions are ones that don’t involve tricky, carefully timed maneuvers (at least from what I’ve played). The collision detection could be a little cleaner, true. I know that may be asking a lot from the developers considering the tech and reconciling the supernatural mechanic of creating matter only where one can see it. For the record, Super Mario Galaxy beat closure to the punch with its Matter Scatter level. I think that the jump speed and distance suit the game. Each of the puzzles I’ve played fit within the screen size. All of the intricacies in solving each puzzle happens in the space of a few steps (of the character). Having a bigger jump wouldn’t positively affect the game play considering that the gameplay only exists in small areas at at time as opposed to huge sweeping obstacles/gaps to overcome. I’m confused as to why the lighted areas I jump into dim and thus drop me to my doom. There’s something strange about jumping over a lamp/light ball that I don’t understand yet. I’ll play more and think more. Regarding the dimming: there are two kinds of ball, a light ball and a “dark ball.” The dark balls dim when the player gets too close. They do, however, provide enough light to activate a dormant light ball. It may have been my own ineptness that gave me trouble, but I often felt that my jumps were just a pixel or two short. Just increasing jumping range by ten pixels would have made my experience a lot smoother. To elaborate more after playing Closure through fully: The “Dark Orbs” actually illuminate more the further you are from them, capping out at a *higher* light level than the light ones. I actually used that as a trick to activate light orbs on a couple levels, and to activate the final door in the game without going through a tedious amount of timed jumping. I actually did not have an issue with jumps coming up short or “gummyness” on the jumping. Sometimes I had to use a bit of care exactly where I dropped my orbs, but mostly the controls were smooth and did what I wanted them to. The few times they didn’t were mostly a result of me expecting to be able to pull the highly unrealistic fall direction control Mario taught me. I did run into some issues jumping off of wall segments with a steep angle on them. I expect it was because they run into the old platformer problem where you can’t jump if you are falling, which was aggravated by the light flicker, but it only happened on a couple levels. The timing on some of the moving puzzles was tight, but I didn’t think it was unreasonably so. I am not that great at jumping puzzles, so if something looked barely possible, I usually found a more forgiving approach with a bit of fiddling. That said, this game was still deviously hard at times, but the challenge was mostly from puzzle elements and orb management. Oh, and a lot of deaths from those stupid dark orbs. I feel like they could have been made to look a little more different.